My walk saw the morning light up Burnie's beach and business sector, sparkle on house windows as people awoke and rabbits in companiable groups revelled in grass on the beach along the way. 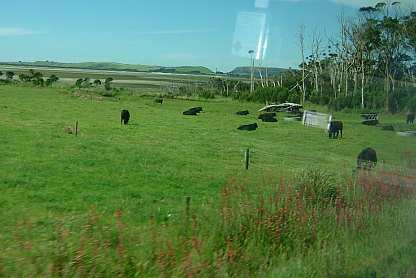 We depart 8.30am and pass through dairy farms with green pastures on our way to Table Cape. From quite a distance, we could see the historic town of Stanley which was settled in 1825. It is dominated by The Nut, a circular hard basalt circular headland 143 metres high - some took the chairlift to the top to see the view from the steep-sided flat top. A tourist town of craft shops, tea houses, potteries and galleries - most of which are housed in the numerous local 19th century cottages. 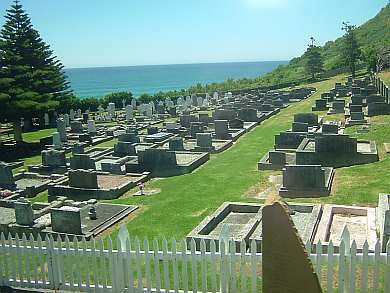 There is an early cemetery nestled by the sea as we entered. Stanley was discovered by Bass and Flinders in 1798 and was named after the British Secretary of State for the Colonies, Lord Stanley and is the second largest settlement west of Wynyard on the northern coast and has a population of 450. Its main industries are fishing and tourism. We next travel the short distance to the Highfield Historic Site to learn how the area’s first European settlers lived. The farmlands, 250,000 acres were bought in 1826. The buildings built in 1832 for the chief agent of the Van Diemens, are in good condition - a time of grandeur and the house with it's high refined chimneys, decorated verandahs, large windows with timber shutters and stately marble fireplaces has been restored with workshop and stables where the horses were kept. Above - I photographed this painted picture in the drawing room of the side view of the house,as it appeared last century - below is the road view and door where we entered - the The Nut can be seen in the distance. See more photos at Highfield here! We carry on our travels to our final guided tour at Allendale Gardens before returning to our hotel at Burnie.